One more in April and Good News out of Springfield? We try to take the week after a big event "off." After the Kitten Shower I had no intention of working on any cats. Of course some came along anyway! 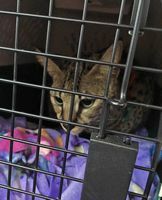 We had been trying to get several injured cats and one was trapped and taken to GEAH on the 9th. 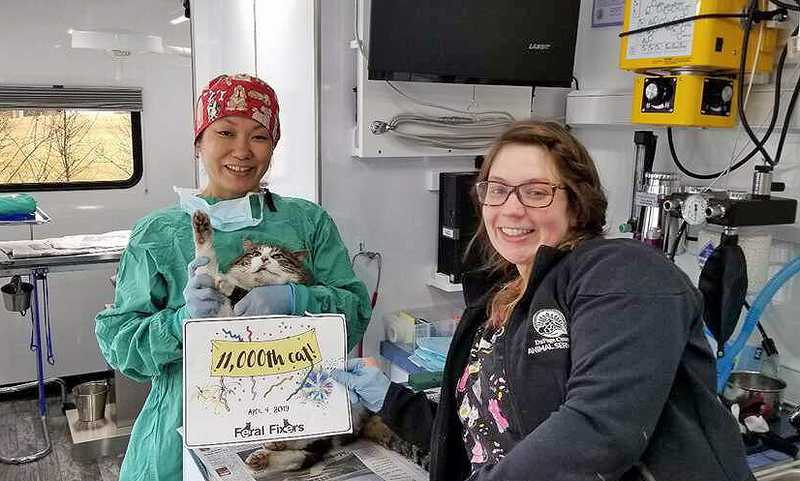 With a severely injured leg, often the only answer is euthanasia, but in Chin-Chin's case it seemed to only be a severe puncture wound that had not abscessed yet. An otherwise healthy cat, we neutered him and loaded him up with antibiotic injections. If we had not managed to get him when we did, his story could have been very different. 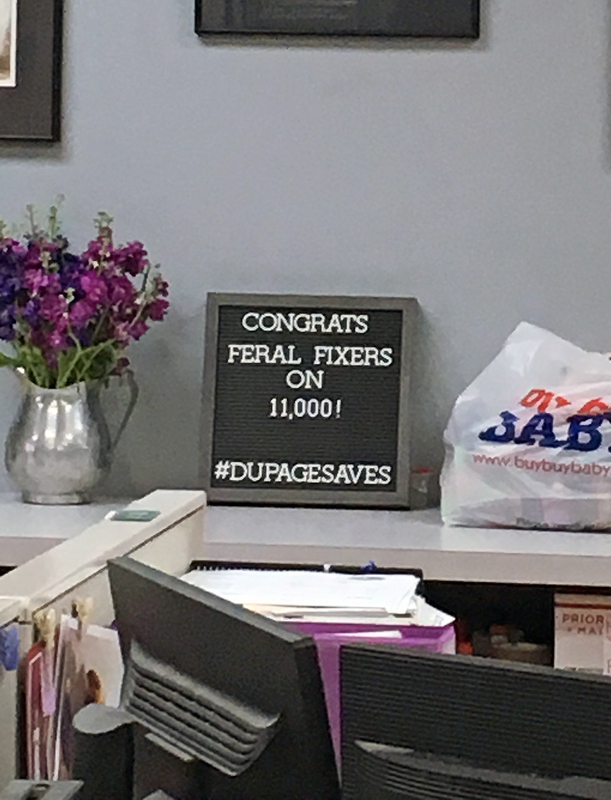 This brings our totals to 19 for April, 44 for 2019, and 11,015 since our beginning. Another project we took on was helping a resident of Hanover Park. You may have heard of the Cook County Ordinance. It allows feral cat caretakers to maintain their colonies, involving strict criteria and registering with one of the rescue organizations that will do so. Quite often, Hanover Park uses the criteria to harass the caretakers. This resident had done everything correctly but the rescue organization is no longer in existence and records are just about impossible to verify. 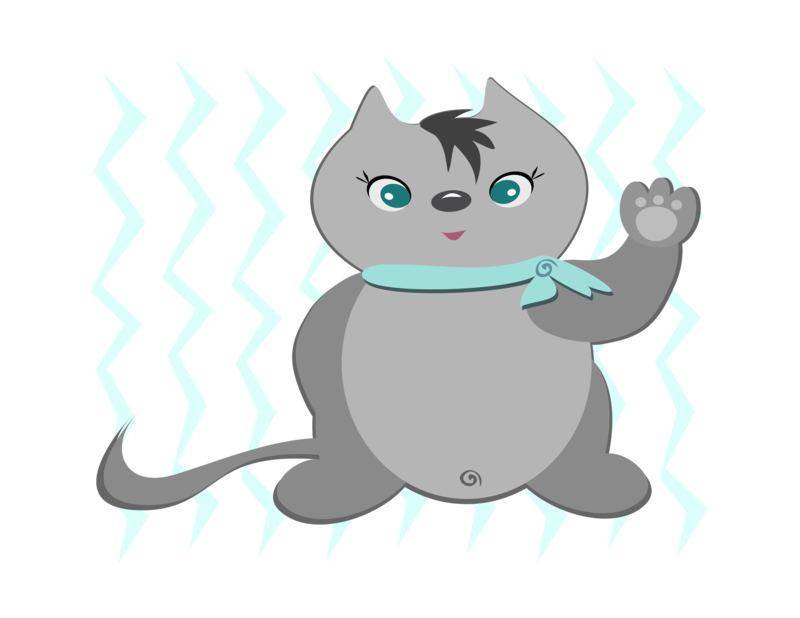 She has since registered with another group and asked us for help in updating her cats. The TNR group that had neutered these cats 6 years ago had NOT eartipped, nor implanted chips. Patches went on the 13th for rabies vaccination, eartip and microchip. Charlie went on the 14th for rabies vaccination, eartip, microchip and a Convenia shot (touch of icky eyes). Now the caretaker has the paperwork for these two to present at her hearing today. Wishing her all the luck! 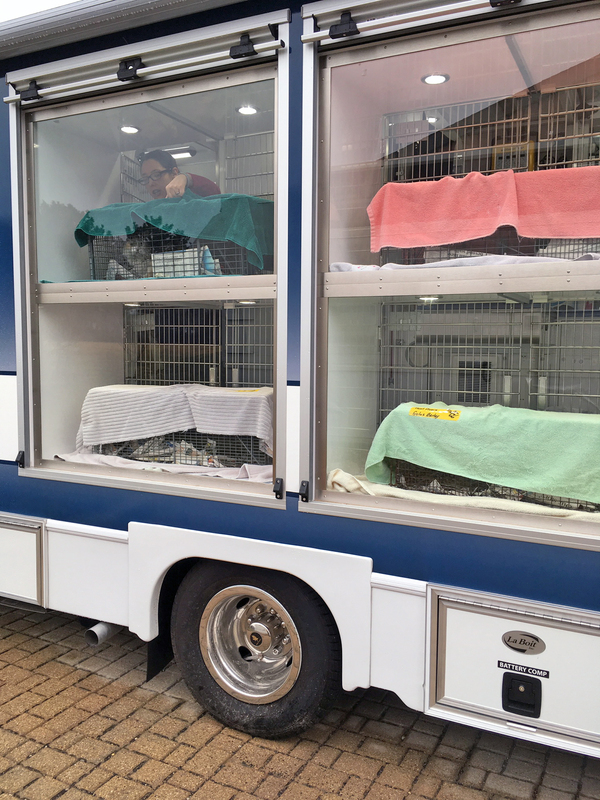 In researching her situation, I found that there is state legislation halfway to being approved that would remove the necessity for a subsequent rabies vaccination after the initial one given at neutering for feral cats. YEA!!!! On a rough guess, there may be 6,000 ferals out there that have had just their initial rabies vaccination. Can you imagine re-trapping every feral? When SB0131 goes to vote, we will try to get the information out to you in order to inform and influence your representative! We tried a new venue for our adoption event on Saturday, 4/13 - the PetSmart in Finley Square Shopping Center in Downers Grove. This is a larger and busier store than our usual PetSmart in Wheaton. It was a sunny, although windy day, so lots of people were out and about. PetSmart was also featuring pet photos with the Easter Bunny. Several people, including a former adopter, stopped by with their cats after having had photos taken with the Easter Bunny. 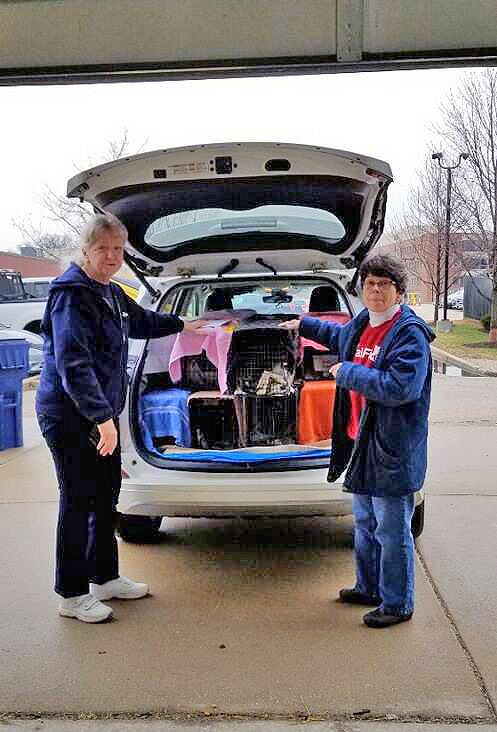 We shared the store with two other rescues who were also conducting adoption events - Chicagoland Animal Rescue (CAR) who has resident cats in the store and 4 Paws 4 U 4 Ever, a dog rescue, who had a number of large breed puppies for adoption. We were situated in the front of the store next to CAR's room. It was a pleasure working side-by-side with Andrea from CAR and all of their great cats. The puppies were in a dog training area in the center of the store. Fortunately, the store is large, so it was quite a distance away, but there were quite a few choruses of barking puppies throughout the day. Jasper, Corazon, Missy and Echo were the stars of our event. They all did very well handling the hustle and bustle of a busier store as well as the barking puppies. Several folks stopped by to pet and interact with them and we handed out a few business cards to potential adopters. Jasper won the heart of a great couple from Schaumburg. The gal recently started volunteering for Feral Fixers and lost a prior cat who was her cuddle buddy. Having been drawn in by Jasper's photos and description, she had submitted an application and been pre-approved for adoption. Upon meeting, Jasper was everything she hoped for, so they decided to take him home from the event. Reports are that he is settling in very well and starting to integrate with their other two cats. There have been several additional adoptions since our last event as well. George was adopted by a terrific gal in Spring Grove, IL, a friend of George's foster mom, Amanda. He is getting acquainted with his new 2.5 yr old male French Bulldog roommate. Things seem to be going well and his adopter loves him. She recently lost an elder cat. Keogh was adopted by a great gal in Elgin. Keogh will have a 7 mo old male kitten as a playmate as well as a 10 yr old miniature dachshund companion. The gal is currently out of the country due to a family emergency, so Keogh's transition to his new home is delayed until her return. Aviva was adopted by a nice couple in Lombard who had met her at the 3/23 adoption event. She is their first and only fur buddy and getting settled in her new home. The adoptions of Hope and Guava (aka Ava) by their foster moms was also finalized. These girls are a bit shy and very comfortable in their current environments. Many thanks to the volunteers and fosters who made this event a success (Sara, Steve, Diane, Laura, Cheri). We were a lean, but well functioning team! Thanks also to Laurel for stopping by at the end of the event and helping with clean-up. Many thanks also for all of the other valuable contributions to this event - to Steve for the excellent photography during the event; to Connie, Stephanie and Ted for promoting the event on our Facebook page and web site; to Steve for the professional-looking cage cards and volunteer name tags; to Debbie and Mike for the on-going updates to the Adoptable Cats & Kittens board and binder; to Sara for helping with adoption counseling and the laundry; to Steve for coordinating our lunch run and donating the proceeds to Feral Fixers. Our next adoption event will be the weekend of May 18-19, which is a PetSmart National Adoption Weekend. We will be back at the Wheaton PetSmart at 63 Rice Lake Square. I am working to finalize if our event will be on Saturday or Sunday, so please stay tuned. We had some nice, spring-like weather for our adoption event on Saturday, 3/23, at the Wheaton PetSmart. The sunshine and moderate temperatures were very welcome after the many cold and rainy events we have had over the last few months. 3 kittens (Echo, Buzz & Woody) and 4 adult cats (Aviva, Jasper, Missy, George) were the stars of our show. Everyone did very well. We were at the front of the store by the dog training area, but fortunately there were no dog training sessions conducted. While there were dog adoptions in the store during the first half of the event, the barking was not overwhelming. Jasper displayed his normal charismatic personality, greeting and pawing at everyone who stopped by, looking for attention. Aviva, George and Missy took a more passive approach, but gladly accepted petting from our guests and volunteers. This was Echo's debut appearance at an event. He took it in stride and gradually relaxed as the day progressed. He will be posted on PetFinder shortly. Woody & Buzz spent no time in their cage as their pre-approved adopters arrived at the start of the event and their foster mom took them directly to a get-acquainted room. The adopters brought their 3 yr old dog along to test interactions. The meeting went well and Woody & Buzz headed home with their new family. We were subsequently visited by two other pre-approved adopters and handed out cards to several other guests. We also received a volunteer inquiry from a gal interested in helping socialize and care for our cats & kittens. Follow-up is underway. Many thanks to PetSmart for hosting the event and for the generous food donations. They also offered to display our board of Adoptable Cats & Kittens outside of events to help draw more interest! Adoptions have continued to proceed outside of our events as well. Saturday, 3/23, marked the start of spring break for many local schools and this has impacted the timing of our adoptions a bit. Keenan was adopted by a wonderful family in Glen Ellyn. They have 2 cats, one of whom is a 7 mo old female kitten whom they rescued from outside, so Keenan will have a playmate his own age. They will be taking Keenan home the first week of April. Currant will be going home with a terrific family in Lombard as a Foster to Adopt following spring break as well. They have a 2 yr old male cat who will be Currant's buddy as well as a 19 yr old female cat who can just watch the boys play. Evian has finally adjusted to the other cats in her foster home and her wonderful foster family in Bartlett has decided to keep her. She is a lucky girl! There is an approved adopter interested in Keogh. The visit & dog test are targeted for the week following spring break. There is another approved adopter interested in meeting Dante sometime next week. So lots of good possibilities! Many thanks to the volunteers and fosters who made this event a success (Sara, Steve, Candy, Diane, Amanda, Rita, Cheri). 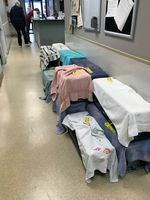 With fewer cages and an experienced team, set-up and clean-up occurred in record time! Many thanks also for all of the other valuable contributions to this event - to Candy for the excellent photography & videography during the event; to Connie, Stephanie and Ted for promoting the event on our Facebook page and web site; to Steve for the professional-looking cage cards; to Debbie and Mike for the on-going updates to the Adoptable Cats & Kittens board and binder; to Sara for helping with adoption counseling and the laundry; to Steve for entering our adoptions into the PetSmart iPad; to Sara/Steve for coordinating our lunch run. Our next major event is the Kitten Shower on Sunday, 4/7, at the Villa Park VFW at 39 E. St. Charles Rd, in Villa Park, 12noon-4pm. Our next adoption event will be Saturday, 4/13. The location is being finalized, so please stay tuned. Still too cold, but still made it to 11,000! 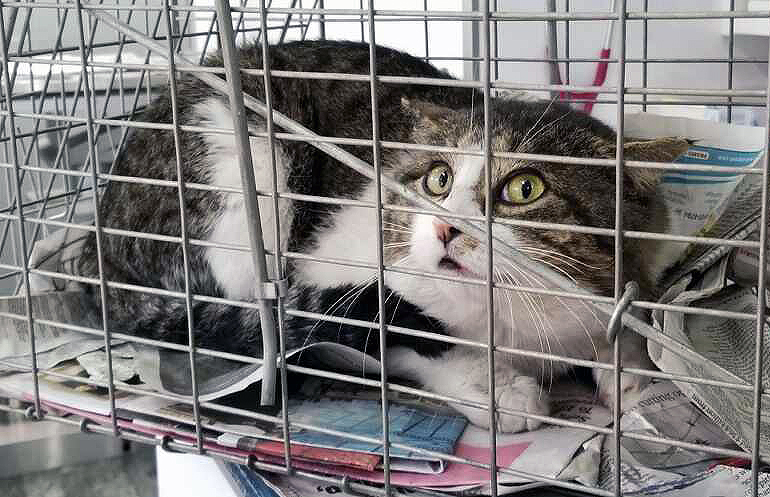 While we were waiting for the temperatures to warm up, we did neuter a couple more cats. On 3/28 we sent 3 feral females to ADOPT. They were kept a little extra time after before being returned to make sure they were up to conditions. 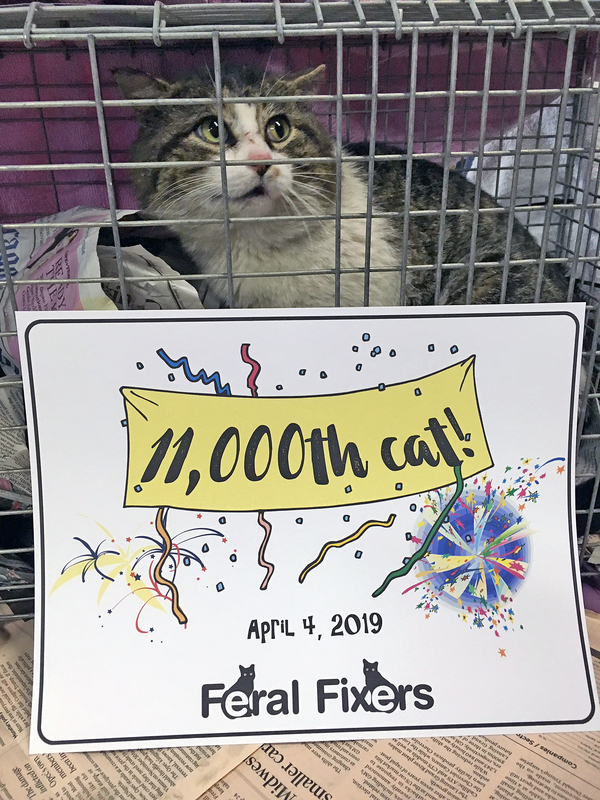 On 3/29 we did a favor for an animal control, neutering a feral that couldn’t go back and then relocating him = 1 feral male. Surgery? I don't think so! We sent 19 ferals to DCAS, 9 females and 10 males. Of them, five were really beat up. One of the males, who had the least injuries, passed away as soon as he received sedation – it is rare, but it happens. Resuscitation was attempted for 15 minutes but to no avail. Big Daddy, #11,000 had quite a day as you can tell from the pictures! 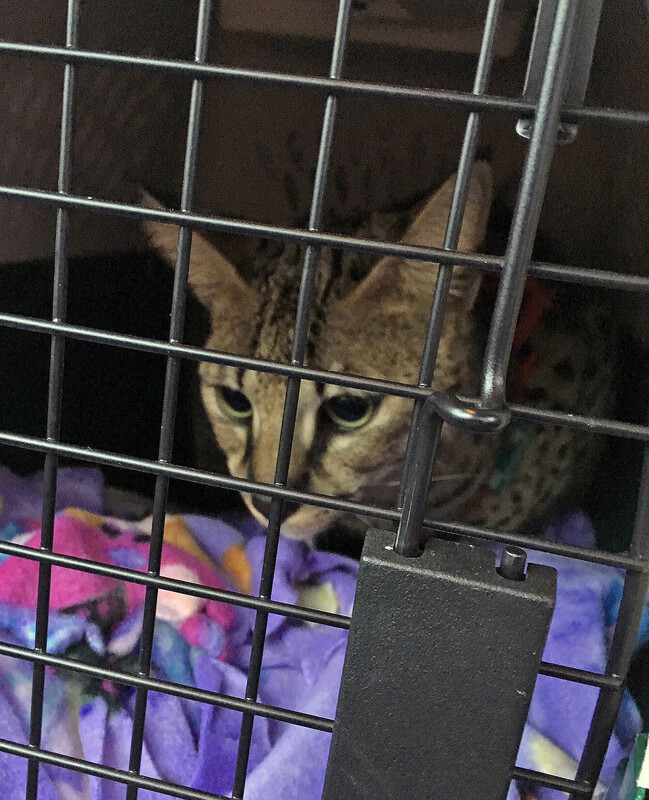 He, as well as another male, Peter, will have to have all four canines removed at Glen Ellyn next Tuesday – broken off with pulp exposed because of too much fighting. This will be expensive but they are very healthy otherwise and can live for years to come. 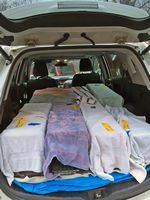 The cats in this post came from Addison, Bartlett, Darien, Des Plaines, Elmhurst, Glendale Heights, Hanover Park, Villa Park, West Chicago, concentrating on females and injured with these trips. This brings us to 22 for March, 18 for April, 43 for the year and 11,014 since our beginning. Hope to see you at the Kitten Shower! Yesterday, we made our first “official” trip to ADOPT for the year. We targeted 2 sets of garage kitties so that they would have a relatively warm place to go back to after surgery. Of one group of nine, there were only two males – that’s enough! We had one friendly, who’s owner takes him out on a harness and leash and no way did we want him to make more! So we had one male friendly, 11 female ferals and 3 male ferals. In addition, we have taken 3 cats to GEAH in March, all male. One was a male being picked on by the colony, hoping he will become friendly. Another was being fed by an elderly couple who no longer felt able to care for him, he was an in/out cat, we’ll see how he does. Third was Cheese, with a neck wound – he got a dental while he was in. This brings us to 18 for March, 21 for 2019 and 10,992 since our beginning in 2007. Certain our next trip will put us over the 11,000 mark – the date of that is yet to be determined! 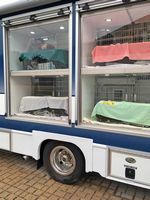 Here are the pictures of one of our loaded up vehicles, the friendly in a carrier, the cats waiting for treatment at the clinic and most of them back at the garage for recovery – a few went elsewhere for recovery, all should be going back home Saturday morning! One reason we’re up in the air about our next trip is we need to be sure preparations for our Kitten Shower are on track. We’re turning donations into some great Silent Auction and Door Prize items! This may be the first Kitten Shower to take place prior to Easter and coincidentally we have had a lot of kid’s stuff donated. Don’t forget about Mother’s Day coming up, too! Thank you to everyone who has been so generous! Its less than 3 weeks away and we’re looking forward to seeing you all! Please pre-register by mail or online so we can be sure to have enough food & beverages. Coming up very quickly is the DuPage Human Race on April 27th. Participants last year had a great time! 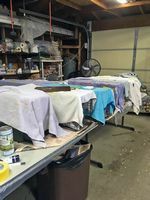 There are several ways you can participate and help Feral Fixers. You can sign up to be a runner by clicking here. Or, you can directly donate by clicking here. Or you can set up your own associated fundraiser by clicking here. More information about the race itself and all the associated activities can be found here! Come out and cheer our group on! The event goal is to have 1,900 participants – you can imagine the positive energy that day! Sign up fee increases on March 31st and race day sign up is available. Our goal is to raise $600 with this event, hope to see you there! Feral Fixers is "Jackson Galaxy Approved!"